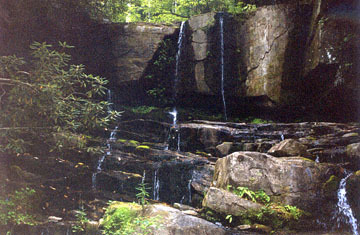 Double Falls on the Laurel Fork Creek make an excellent lunch stop as you backpack to Laurel Fork Falls on Lake Jocassee. The falls are also a good turn-around point if you want a excellent day hike on the Foothills Trail from the Laurel Valley Access off US 178. 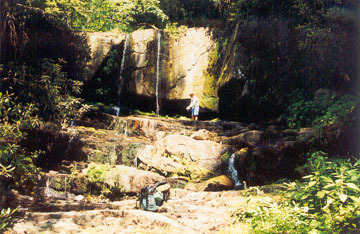 The 25-foot high falls, depending on water levels, could have as many as five sections. During August 2002, it barely had four sections. The 4.7-mile hike is moderate to strenuous with lots (and I mean lots) of wooden steps to climb as you ascend and descend. The 18in long x 6in deep x 4in high wooden steps are fixed to the hillsides with two 24in steel rebar rods, courtesy of Duke Power. 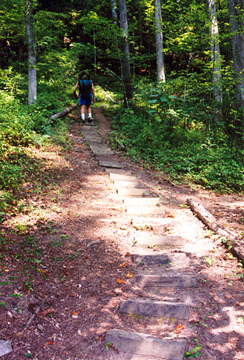 The trail begins across the road from the Laurel Valley Access parking lot. 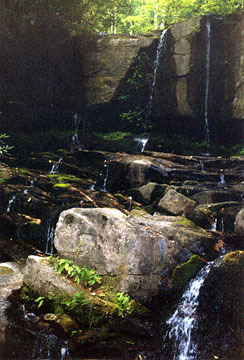 Hike the Foothills Trail (white blazes) for two to three hours up and around Flatrock Mountain. You'll know that you are getting close when you descend to Laurel Fork Creek. You'll cross the creek on several substantial wooden bridges. 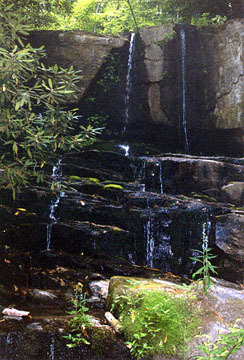 As you reach a small bench, you should hear the falls below. Descend more steps on the trail and look for a footpath to the left that goes to the base of the falls. For more trail details, get a copy of "The Foothills Trail: A Comprehensive Guide" and/or a map of the Foothills Trail at a local outdoor outfitter or from the Foothills Trail Conference. Proceeds from the sales of the guidebook and map help pay for trail maintenance. Directions: From Pickens, drive north 17 miles on US 178, crossing SC 11 along the way. After entering the Rocky Bottom community, look for Laurel Valley Road on the left. There should be a Foothills Trail sign at the correct turn. After turning left off US 178, take the bumpy, somewhat rutted graveled road to the right uphill for about .5 mile to the Laurel Valley Access parking lot.